The knee ligaments are one of the vital components of knee stability and control. Ligaments are thick fibrous bands, like ropes, and their job is to provide stability and control movement. The knee ligaments connect the thigh and shin bones (femur & tibia) and work together to control how the knee moves to keep it stable and prevent injury. There are two pairs of ligaments in the knee, the collateral ligaments (at the side) and the cruciate ligaments (in the middle). These ligaments are frequently damaged by sudden twisting movements e.g. changing direction quickly when running, or a force through the knee e.g. a fall or tackle. After a ligament injury, the knee can feel painful, weak and unstable. This may only last a few days, but if left untreated, can persist for many months. If this happens, wearing a brace can help. Here we will look at the different knee ligaments, how they work, and what happens when they get damaged. The collateral knee ligaments are found on either side of the knee joint. They are responsible for providing sideways stability by holding the femur and tibia bones together. There are two collateral ligaments, medial and lateral. The medial collateral ligament is found on the medial (inner) side of the knee. It is a broad flat ligament approximately 10cm long attaching to the femur and the tibia. 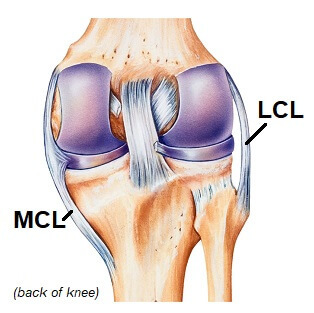 The MCL resists forces from the outside of the leg (known as valgus forces). The medial collateral ligament gets damaged when there is a force through the outer side of the knee, overstretching the ligament. This results in pain and swelling on the inner side of the knee joint and the knee may feel unstable depending on the severity of the injury. Visit the MCL injuries to find out loads more including treatment and prevention strategies. The lateral collateral ligament is found on the outside of the knee, attaching to the femur and the fibula. It resists forces from the inner side of the knee (known as varus forces). 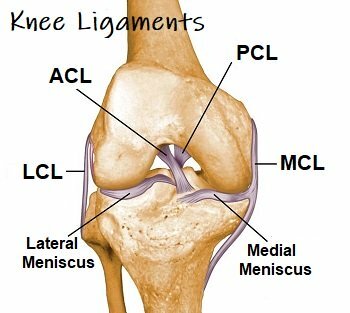 The lateral collateral ligament is much shorter than the medial collateral ligament making it much less common to injure the LCL than the MCL. These are the most important knee ligaments in providing stability of the knee. There are two cruciate ligaments, anterior (ACL) and posterior (PCL). They sit deep inside the middle of the joint attaching to the tibia and femur. They cross over each other, hence their name, and resemble the St Andrews Cross (X). The cruciate knee ligaments are each about as thick as a pencil and are extremely strong, with a breaking strain of about 60kg. They get their name from where they attach to the tibia, i.e. the ACL attaches to the anterior (front) surface of the tibia and the PCL to the posterior (back) surface. Their job is to control the forwards and backwards movement of the knee joint. They are also important in providing proprioception – the body's ability to know where it is and to make subtle adjustments to maintain balance. Each ligament is about 2cm long and any force which stretches it an additional 1.7mm (8% total length) will result in complete tear. The anterior cruciate ligament sits deep in the middle of the knee joint. It attaches to the front of the tibia and the back of the femur. The ACL stops the tibia sliding too far forward in relation to the femur and is the primary structure for proprioception. The anterior cruciate ligament is commonly injured in sporting activities such as football and skiing, usually from awkward twisting movements, sudden stopping or landing awkwardly. It can take up to a year to recover from an ACL injury so prevention has become an important factor in sports training. 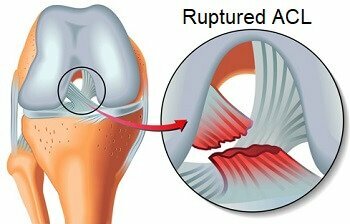 To find out more visit the ACL injuries section for in-depth information on injuries, surgery and rehab. The posterior cruciate ligament also sits deep in the knee joint and it attaches to the back of the tibia and the front of the femur. 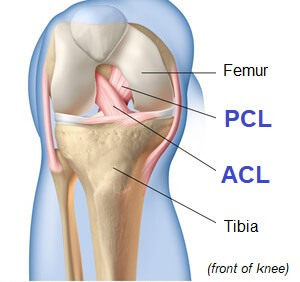 The PCL is shorter than the ACL (3/5 of the length) but is twice as strong. 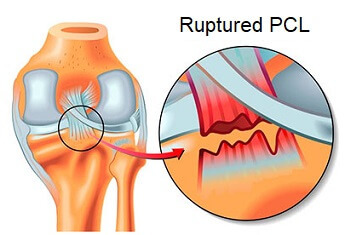 As a result it is much harder to injure to PCL. The PCL stops the tibia moving too far back in relation to the femur. The posterior cruciate ligament is typically damaged by a sudden force through the top of the shin, from a car accident or fall, or by hyperextending the knee. You can find out loads more about the causes, symptoms, treatment and prevention strategies in the PCL injury section. To find out more about knee ligaments injuries or for help diagnosing your pain click on the relevant links. Quiz Time: What is the difference between a ligament and a tendon? A ligament joins bone to bone whereas a tendon joins bone to muscle.